Most investments are denominated in U.S. dollars. If the dollar falls through the floor, do all our investments suffer the same fate? Can investments held in brokerage accounts be protected? The reality is that all assets in your brokerage accounts, including foreign stocks and foreign currencies and even gold, will be priced in dollars. But that doesn’t mean they are dollar-based investments. The assets are simply valued in dollar terms for accounting and tax purposes. The dollar price reflects the exchange rate on any given day for that foreign asset or ounce of gold. Unless the dollar becomes worthless, we should always be able to assign some dollar value to non-dollar assets. If the currency of measurement collapsed to zero, then any investment that derives any value from a source other than that currency would theoretically go to infinity. U.S. stocks would still have worth, since corporations have real assets on their books (although many would have difficulty selling their products in the kind of economy that might accompany a dollar collapse). Stocks, foreign currencies, and gold would continue to have an exchange rate with other currencies. U.S. bonds, though, would have no value. Investors wouldn’t be willing to pay anything for a worthless income stream, so a U.S. bond would be worth nothing in terms of any currency. (1) Can I bring gold and silver coins out of the country? (2) Do I need to declare them to Customs if so? (3) How many of them (or how many ounces) can I bring? The U.S. government says you must declare to Customs all cash or “monetary instruments” that amount to more than $10,000. This reporting requirement does not apply to non-monetary assets such as gold jewelry and would technically not apply to bullion rounds or bars, either, because they are not legal tender. What do you think might happen to gold owners if the USA returns to the gold standard? It’s possible that gold could be quickly reinserted into the monetary system during a global financial crisis, and Asian countries are slowly but surely moving in that direction regardless. However, we believe the most likely path is that gold and silver steadily reassert themselves over time as money on their own and trudge their way toward de facto 100% backing of the currency. 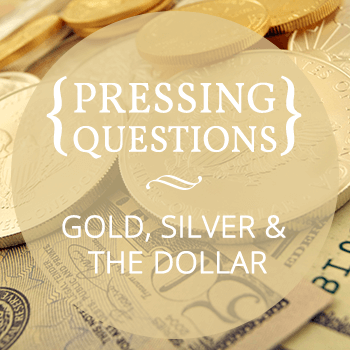 When purchasing gold, do you recommend American Eagles, Krugerrands, Maple Leafs, or bullion bars or rounds? We think it is most important to keep premiums as low as possible while keeping an eye on your ability to sell when the time is right. Therefore, among actual coins, we generally recommend Gold Maple Leafs and South African Krugerrands. Gold American Eagles are a bit higher priced, but, as the most popular and widely distributed bullion coins in the U.S., they may be worth the modest additional premium if you don’t yet own any.